JUST A LITTLE WHILE AGO at a Saṅgha picnic one of our group remarked that an elaborate crop circle had appeared in fields near where they live. The person began to speculate about the mystical symbolism of the crop circle and seemed unaware that crop circles are all artificially made. I mentioned that the original crop circle makers—Doug Bower and Dave Chorley—had confessed their hoax and demonstrated their method. 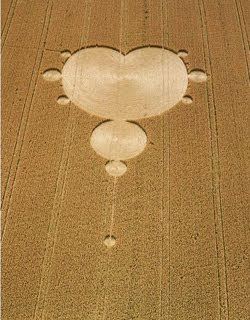 My informant, tried to dodge the fact of the hoax, and pursue the mystical significance of the new crop circle. I'm puzzled by the attraction of mystical explanations for things—spirits, aliens, etc.—especially when there are more straightforward answers. When the original crop circle makers have confessed and showed how they did it, and crop circles are now routinely used by the advertising industry, why are people still attracted to the idea that crop circles have mystical significance? What really sparked me off, however, was watching a documentary, Messiah , in which Derren Brown, an entertainer who specialises in using the power of suggestion and an ability to 'read' people's body language and facial expressions to create the illusion of psychic powers. Brown is different in that he admits he is a showman, and explains how he does what he does. In Messiah, Brown travels to the USA where he is virtually unknown, and proceeds to try to obtain personal endorsements from leading members of New Age or Alternative groups: psychics, mediums, alien abductees, and an evangelist. The evangelist is impressed though not willing to publicly endorse Brown, while the others—experts in their 'fields'—are entirely taken in and enthusiastically offer to endorse him. In other words Brown uses his skills to convince a group of psychics that he is real psychic; a couple of alien abductees that he was abducted by aliens and can now tell them their medical histories; a group of strangers that he is in touch with their dead relatives (and knows intimate details of their relationships); and a prolific New Age publisher that he can record and play back her dreams with his dream device. With the evangelist he demonstrates an ability to instantly convert a roomful of sceptics to belief in God. He actually does this with a simple touch in one case, and by imitating those evangelists who "bring down the Holy Spirit" in another case, though his method for the rest is clearly plain old hypnotism. The pastor alone is cautious about accepting Brown on face value, but he is still visibly impressed. A similar hoax—Project Alpha —was perpetrated by the magician James Randi, aka The Amazing Randi. He commissioned two amateur sleight-of-hand magicians—Steve Shaw and Michael Edwards—to convince a team of researchers at the University of Washington that they could bend spoons with their psychic powers along the lines of the infamous faker Uri Geller. This they successfully did, managing to bypass all of the 'scientific scrutiny' of the research team, including video cameras! Shaw and Edwards continued with the hoax for a considerable time, even after it became clear to the university that when the experimental protocols were tightened up that the two could not perform any psychic feats. They became minor celebrities travelling the country to demonstrate their "powers". However eventually Randi himself admitted the fraud and the credulity of the "psychic" community was painfully exposed. Project Alpha subsequently inspired a number of copy-cat hoaxes with more or less the same result. Randi has exposed other fraudulent psychics. Recently in the UK psychic Sally Morgan was exposed as a fraud. She apparently uses the same technique as seen in the lesser known Steven Martin film Leap Of Faith : where assistants gather information from the crowd as they take their seats, and feed it to Martin through a concealed ear piece. However being exposed does not necessarily mean that a psychic is put out of business. In 1986 Randi exposed Peter Popoff as the same kind of fraud on Johnny Carsons's Tonight show, but he is back with a vengeance fleecing the credulous and making tens of millions of dollars doing it. The message seems to be that people want to believe. They want to believe in spirits, in immaterial beings and gods, in mysterious energies, in crystal vibrations, in psychic powers. People want to believe in magic. This desire to believe affects our judgement: it affects what we pay attention to, and the weight that we give to what we see and hear. The effect of this is that what we believe is apparently confirmed. It's called confirmation bias. For every "proof" that people have psychic powers, there is a demonstration of cynical fraud. So we should at least be very sceptical about psychic powers. But a lot of us are not. We only look for evidence that confirms our views, and we wilfully ignore any contradictory evidence. But more than simply wanting to belief, people don't want to not believe - they consciously reject the rational alternatives to magical thinking. People apparently don't want to believe in science which they see as prosaic, mundane, and uninspiring. Accurate, but dull and limited. Whereas magic is exciting and has infinite possibility. My own experience of science is completely the reverse of this: my encounters with science continue to expand my mind, make the world seem more amazing, more wonderful, more inspiring, more alive, less limited. The real down side of credulity is that every day people are being ripped off by unscrupulous con-artists. For instance they are paying for 'healing' that at best is the placebo effect, but which as worst is harmful. Recently in the UK the writer Simon Singh was sued for libel by the British Chiropractic Association because he said "... it happily promotes bogus treatments" and that the treatment could be "lethal". The law suit was eventually dropped as it became clear that they would not win. Singh had made truthful statements, based on published research, even if he was being sarcastic. One cannot be sued for being sarcastic in the UK, nor for being a science journalist how reports on research. This is not to say that science or medicine has all the answers. Patently it does not. Or that scientists and doctors have not harmed people. They have. But within medicine and science there are checks and balances. Magical thinking allows for no checks and balances. If something goes wrong it is because you did not believe. And of course we do know that the placebo effect is dependent on you believing you've had an effect treatment, but this is not very reassuring if we are genuinely ill. In the past I have been critical of the way Buddhists present their own beliefs as simple representations of Reality. (e.g. Rescuing the Dharma from Fundamentalists) This so-called Reality is often simply an intellectual regurgitation of metaphysical theories found in popular books on Buddhism. As such it's a blind belief not rooted in experience. David Chapman has referred to this as "effing the ineffable". And since we are explicitly against this approach to religion we Buddhists appear to be incoherent and self-contradictory at times. Buddhists, like other human beings, want to believe, and are often credulous in their approach to the traditional Buddhist narratives. Such credulousness is not helpful, but breaking out of it requires us open our minds to the possibility that we are wrong. 'Beware the spinal trap: Some practitioners claim it is a cure-all but research suggests chiropractic therapy can be lethal.' Guardian.19 Apr 2008. 'Psychic Sally Morgan hears voices from the other side (via a hidden earpiece).' Guardian. 20 Sept 2011. For a discussion of the other side of the placebo effect look at: The Dark Side of the Placebo Effect: When Intense Belief Kills; and What's the Harm? Tim Minchin. If you open your mind too much your brain will fall out.